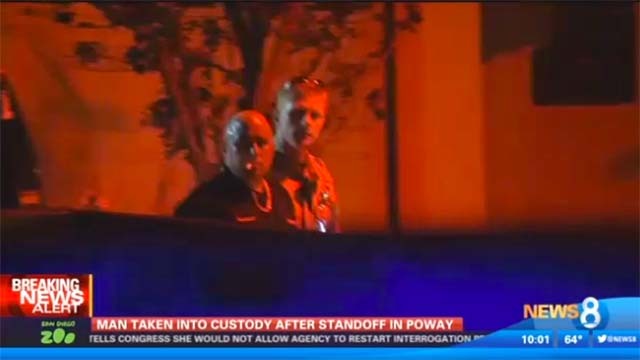 A Poway man who holed up in his home with his ex-girlfriend after a fight that prompted a sheriff’s response pleaded guilty Tuesday to a felony charge of resisting an executive officer while armed with a shotgun and a BB gun. Defense attorney Ashby Sorensen told Judge Polly Shamoon that Henry is the manager of a tire store in Scripps Ranch and being jailed could jeopardize his employment. The judge said she would consider — but not promise — alternatives to custody at the time of sentencing. Henry was arrested the night of May 9 following a 90-minute standoff. Deputies were sent to the defendant’s home in the 13000 block of Utopia Road about 7:30 p.m. in response to a report that he was behaving in a threatening manner toward a former romantic partner, according to sheriff’s Lt. Christopher Collier. As deputies tried in vain to persuade Henry to give himself up, they heard shots — from a BB gun — coming from inside the home. Authorities evacuated several nearby residences as a precaution during the fraught encounter, Collier said. Eventually, Genesta walked out of her former boyfriend’s home and was taken into custody on suspicion of violating a restraining order. A short time later, deputies took Henry into custody.